MyOrangePot.com is owned and operated by Buntari Martosudirjo, or as most people know her … just Tari. Tari’s passion is cooking and she is also an enthusiastic cookbook collector. Currently her collection of cookbooks numbers over 100 and still growing. She is a musical instruments junkie with quite an impressive collection of drums and other percussion instruments. For Tari Le Creuset products are the most beautiful things on earth. She named this blog after her first purchase from Le Creuset, the Le Creuset Orange/ Flame/ Volcanic cast iron round pot. She spent one year contemplating buying this pot but once she had finally purchased it and used it, her collection of Le Creuset began to increase rapidly. For the past 5 years she has been adding to her collection with a wide variety of Le Creuset pots, pans and other products. 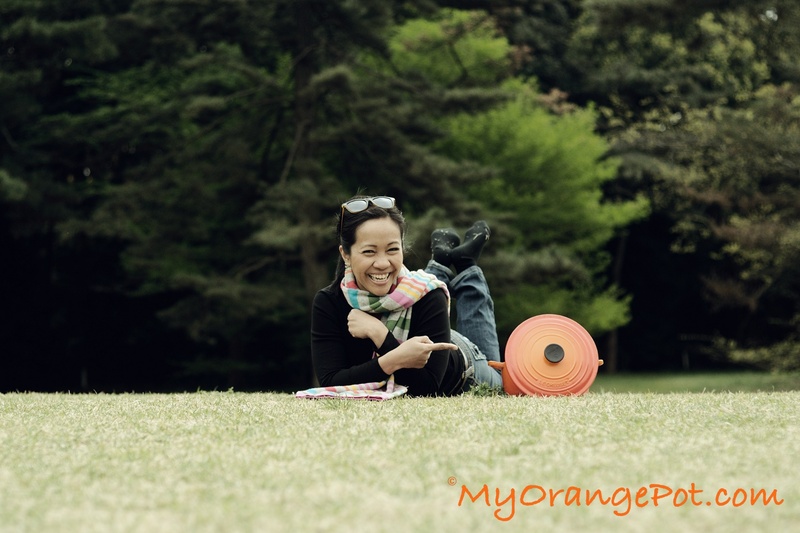 Tari was born and raised in Indonesia (except for the few years spent in Bangkok Thailand during her childhood), but has spent all of her adult life in Tokyo. She is a passionate traveler and a somewhat-health-conscious foodie, a rebel cook at heart who never follows any recipe to the t, radically adapting any recipes to her liking and also to what is available in her kitchen. There are too many wonderful foods that Tari is unable to choose one as her favorite. However, Thai cuisine would be her favorite cuisine. As far as cooking techniques go, French cuisine fascinates her, and the philosophy of Italian cooking also excites her. Her cooking inspiration will always be her beloved Mama and Jamie Oliver. Tari would be extremely happy if you would leave your comments, ideas, recipes and opinions and don’t forget to tell her what your favorite food and cuisine is!! As English is not Tari’s first language, please accept her apology if there are any mistakes in the English used.